Our newest WalkFit mentor, Susan, came into the No Boundaries programs in a roundabout way. She was always more interested in reading than in exercise until she graduated college. Unlike her sister who loved to run, Susan was not even able to finish the 1 mile run for the school fitness tests without walking most of it. After gaining the usual “freshman 10” and then adding to it her first year out of college, she grudgingly joined a local YMCA and began to take aerobics classes. Twenty years later, still enjoying the various cardio strength classes that she participated in, she decided that she wanted to be able to run that mile without stopping that she had never been able to do before. So, she began a learn-to-run program on her own. 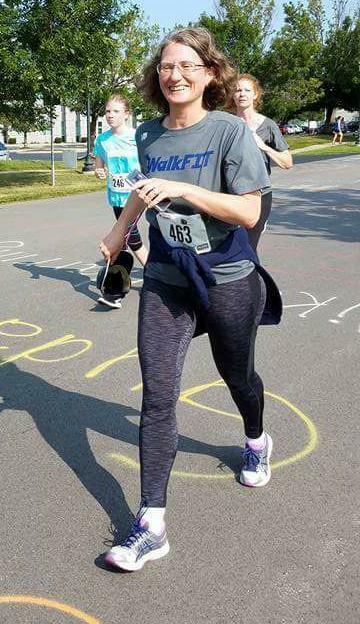 After several years and three tries, she was finally able to participate in her first, second, and third 5k in the fall of 2014. And then… She took the winter off from running and learned a hard lesson. If you stop just after you start, it’s hard to get it back again. She walked through the doors of Fleet Feet in the summer of 2015 looking, as most people do, for some help with shoes, and walked out the door with a pair of Brooks Glycerins and an invitation to come join the Monday/Wednesday public fun runs. Always more of a group exercise person, she had been struggling with getting back to running a 5k on her own. The public workouts turned out to be just what she needed. It was in the public runs that she started hearing about the various classes that Fleet Feet offers in Buffalo. Most of the people she ran with were either past participants, current participants, or mentors. It soon got to the point that everyone assumed that she had participated in the programs, too. That did not happen until last year, when she hurt the tendons in her left ankle. With strict orders not to do any impact or stressful exercise, she joined the WalkFit class to at least keep moving. Walking, especially in the woods with her family, had always been a favorite pastime, but even knowing that it had great health benefits she had never really thought of it as exercise up to that point. She was released from the exercise restrictions just in time to participate in her first 5k as a fitness walker. The next session, she signed up for WalkFit again even though she was now allowed to pick up her usual high impact routine because she wanted to see how fast she could walk that 5k. Her goal was to finish in something close to 37 minutes, and she met it. This session, she volunteered to be a mentor to help other people learn that joy of setting a goal and accomplishing it with a little bit of help and a lot of encouragement. And to give back, just a little, to the friends and “family” that helped her to find a new sport to love.